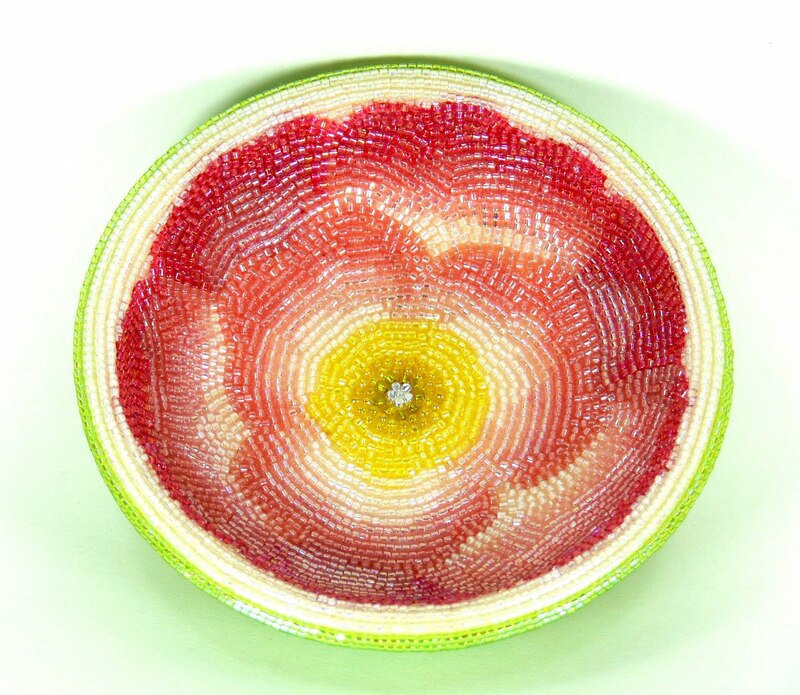 Meredith Dada takes beading to an intricate new level with her figurines, ornaments, bowls and a jewelry box you have to see to believe. 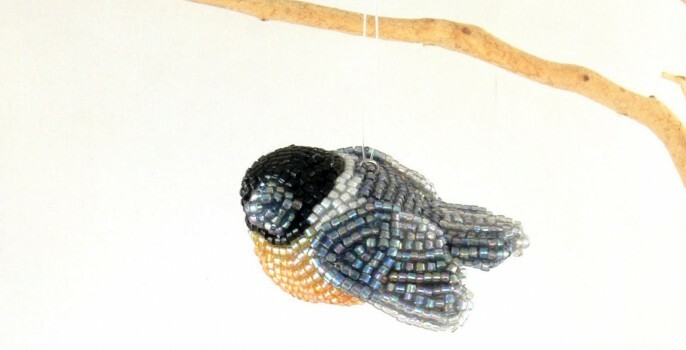 In her Etsy shop, you can find tiny birds, frogs, dragonflies and owls decorated with tiny beads and hand-placed with tweezers. 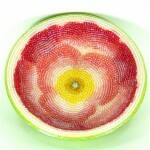 Meredith was gracious enough to share a bit about her life and her process for creating these beaded wonders. When you’re not in the studio, what occupies your time? I hate to admit it, but when I’m not in the studio beading I’m thinking or talking about beading! It takes effort to separate my work and life – thankfully my family keeps me as balanced as they can. I’m a stay-at-home mom with an energetic four year old boy. He occupies most of my time, especially now that school is out for the summer. There always seems to be housework to do and just the normal job requirements of being wife and mom. One of my non-bead related passions is cooking. I love to sit down with new recipes and try new food. We love to explore Denver – there’s just so much to do here! We try to go on hikes regularly; sitting hunched over a worktable for hours isn’t good for the body. I do what I can to undo those hours spent hunched over, and getting out in nature really keeps the creative juices flowing! What do you use for the base of your figurines? I use air-dry craft clay as my base for the figurines and bowls. I have a background in ceramics, but I found that the ornaments would get too heavy if made from low fire clay. Depending on the piece, I use a combination of air-dry clay, foam, cardboard, and wood. Your figurines are so lifelike. Do you create a pattern from a photo? How long does one piece take to make from start to finish? When I’m designing a particular bird Google Images is my best friend! I try to find as many angles as possible for the bird I’m working on. I paint them with as much detail as I can, then I either match the bead color or use a translucent bead on top of the paint to create the desired effect. I make molds of the original birds so I can reproduce them consistently in clay, then hand-paint the details. I have quite a few birds in my collection; sometimes I have to refer to photos from my Etsy shop to remember how to paint one! The production time depends on the piece. It starts to feel like work if I time myself, so I can only guess at the time involved. Sculpting a small figurine takes a while, but once I’ve made the mold it goes much faster. The clay has to dry overnight, then painting takes about 20 minutes. After the paint is dry, I start the beading process which takes about two hours. I always watch movies or TV shows while I work; the last figurine took two episodes of X-Files to finish the beading so that’s a good benchmark. Custom pieces or new pieces can take several hours! 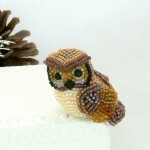 How did you get started beading and selling on Etsy? How has your shop changed since it opened? My love of beading came from my Grandmother. She beaded Christmas ornaments and Easter eggs every holiday. She taught me to bead and I always made my own ornaments. 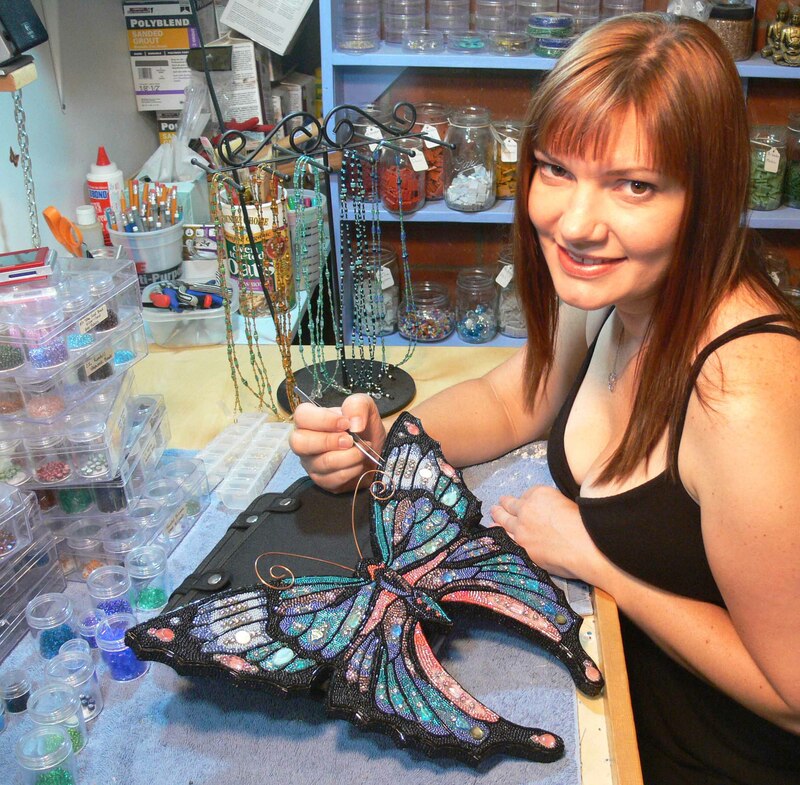 I saw beading as more of a hobby; before I opened my Etsy shop, I was making mosaic furniture. I made large outdoor tables from my own handmade tile and sold only in galleries. After my Grandma passed away, I was given her huge bead collection and realized I could “mosaic” them onto things in a smaller scale. I love my mosaic work, but the sales on such large pieces are inconsistent. I started beading wall hangings, trays and bowls. I found Etsy and I decided to make a small collection of work and see how it went. My first pieces were really ideas that came from my mosaic work. 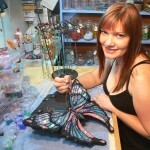 I wanted to make smaller, more manageable items that I could easily ship but still had the look and feel of my mosaics. 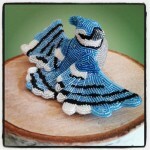 One day, on a whim I decided to make a little bird out of leftover beads from a larger project. I had no idea that four years later my shop would be filled with birds! Birds are very prominent in your shop. Do birds hold a special significance to you? I got such a positive, surprising reaction to the first bird I made that I had to make more! 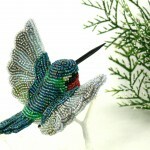 I was making colorful birds using my favorite beads, but not concentrating on specific types of birds found in nature. 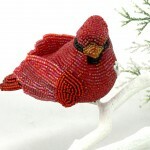 I started getting requests for particular birds and I loved the challenge of researching a bird to create it in beads. People started emailing me lists of birds I should make – I’m still working off of that list today! It’s not so much about my connection with birds but about my customer’s connections with them. I hear so many stories like “My sister just passed away and she loved Chickadees so I’m buying this in memory of her” or “Can you make a Cardinal for my Grandmother, she’s in the hospital and misses seeing her birds outside.” Most of my shop items are from custom order requests that I loved it so much, I made it a regular item. Hearing stories about what the bird means to a customer – it’s an extraordinary honor to be a part of that. The connection with people buying my work is something I never expected, but now it’s one of the reasons I love what I do. Hearing the stories makes me feel like what I’m doing is important – even if it’s on a very small scale. I used to work with micro seed beads, but found that the pieces were too time consuming. With your work being so intricate, how can you charge such reasonable prices? I try to keep my costs down; I buy all of my beads in wholesale quantities. My supply cost per bird is extremely low. My work is very labor intensive and time consuming, but I’ve streamlined my process through the years. The way I work is sort of an exercise in meditation – I get into a zone and things just flow quickly. However, I know I don’t pay myself enough for the time it takes me to make each piece. 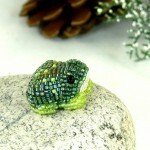 When I first started my beadwork, sales were slow and it was difficult to get out there. Since my son started preschool I’ve been able to work more. The last couple of years I’ve made a huge leap forward in both sales and production. As demand goes up slowly, so do my prices. I’m very happy with the slow growth of my business – I never know what’s waiting around the corner so I just go with the flow! What’s been your most challenging custom piece? A Blue Jay has been on my to-do list for over a year, but I’ve been so busy with my regular sales I kept putting it on the back burner. Recently, I got a request for one and it gave me the excuse to finally make it. It’s the largest bird I’ve made yet; they have beautiful black and white markings that were important to capture. The wings were challenging, but I love how dramatic they are. That one was incredibly time consuming but worth it in the end, he’s one of my new favorites. I plan to make one or two small changes and add it as a regular item. I also want to make a smaller hanging ornament. 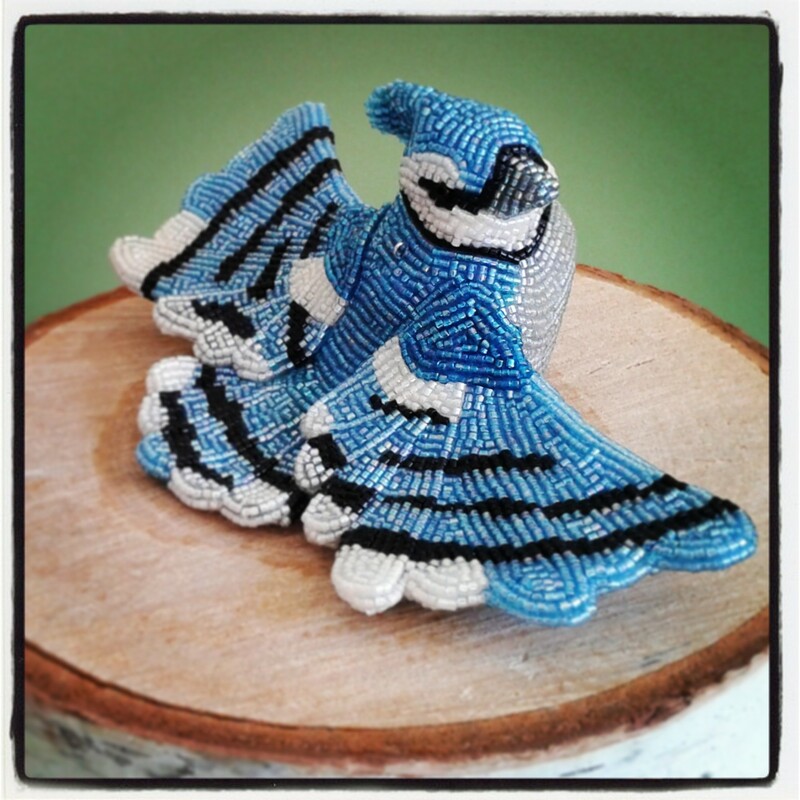 I just recently listed a tiny Blue Jay figurine for sale. 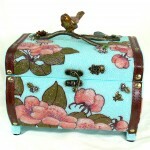 Can you tell us a bit about the Cherry Blossoms Jewelry Box project? This was one of my favorite projects! It came together so naturally, I can’t help but think it was meant to be. I found a jewelry box in a clearance bin at a local craft store. I loved the shape and bought it thinking I would mosaic it. I found the bird and branch handle in another local shop. It’s actually a handle for a kitchen cabinet – since they only had three left they were also on sale. The project sat in my studio ignored until I took a trip with my husband to San Francisco. We always like to stay in Japantown; at the time there was cherry blossom art everywhere. I loved the pink shades against the green leaves and blue sky. When I got home, I knew what I wanted to do with the box. In order to do it right, I needed to bead it instead of mosaic. I painted the box that night – my husband said I was crazy! It was an ambitious project, but I knew it would be something I could be proud of. I started collecting charms and rhinestones and piecing it together. I continued to make my birds and worked on the box off and on. My goal was to enter a large piece into a juried show at the local Ojai Museum; it took about three months to complete and was finished just in time to get into the show! What has been your experience selling locally? We just moved to Denver, so I haven’t done any local events here yet. I did shows in California and sold in several art museums. Selling locally is such a great experience. I love meeting people, talking about my work and hearing which bird is their favorite. It’s also a great chance for people to see my pieces in person. I hear over and over from customers that the photographs don’t do them justice. They sparkle and shine so much in the sunlight – something I can never capture accurately in a photo. I’m still trying to decide which one of her birds to put on my Christmas wish list. See more of Meredith’s meticulous beaded creations at her Etsy shop, or follow her on Facebook to get updates on her latest work and custom orders. Meredith also has an extensive gallery of all her work on her website. Wow! Your work is simply amazing! All the best!